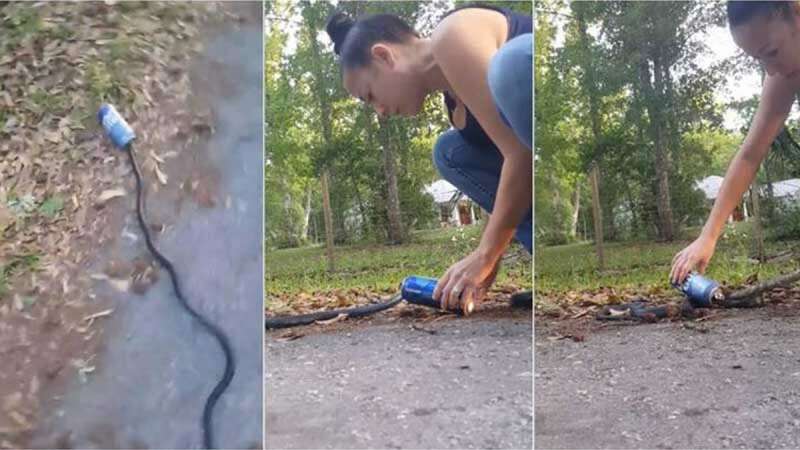 Florida : In a normal scenario, people go the opposite direction snake is spotted, but a Florida woman did something exceptional. She went towards a snake in distress and tried to free his head stuck in a beer can. With her bare arms and armed with only a branch of a tree, she proceeded to save the reptile even though she was extremely scared. “I gotta save a snake! Oh God, I don’t know how I’m going to do this!” Fond could be heard saying nervously in the rescue video. As shown in the video posted on Facebook, the woman first tries to free him by breaking the aluminium can but when the reptile starts moving fiercely, she takes help of a wooden stick to free the snake. “Please don’t bite me when you get out,” Fond can be heard while trying to save the snake. During the process, the snake wraps her hand twice.